Many of you probably noticed that this post accidently went live on Saturday without being completely finished. We forgot to reschedule it in our content calendar, so surprise! You all ended up getting a recipe for this without any description or photos in your inboxes. But it’s here now for all of you in all of its glory! And I apologize for the error on our part. So here it is: a creamy, nutritious, curry-flavored soup with butternut squash, lentils, turmeric, coconut milk, ginger and garlic. To give it an extra umami flavor, I added in peanut butter and stirred in spinach for a little nutritional boost (kale would also work well). 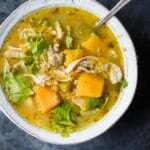 It’s addicting and I love crushing up crackers to absorb more of the creamy butternut broth. Also who doesn’t love crackers in their soup. CRACK A LACK SOUP. This soup is SUPER easy to make and I even have a slow cooker option for you available in the note section. It’s great if you’re trying to incorporate more plant-based meals into your diet too. 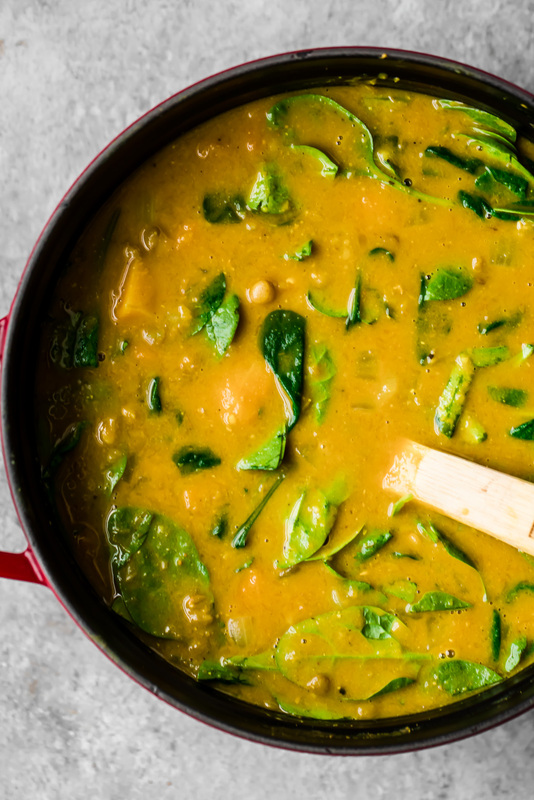 Best of all, this soup is lovely for helping you heal after you’ve been sick — you’ll find plenty of superfoods, anti-inflammatory ingredients and herbs in this recipe. I hope you enjoy this recipe as much as I did. I love topping it with cilantro, chopped peanuts and a dash of hot sauce. xo! 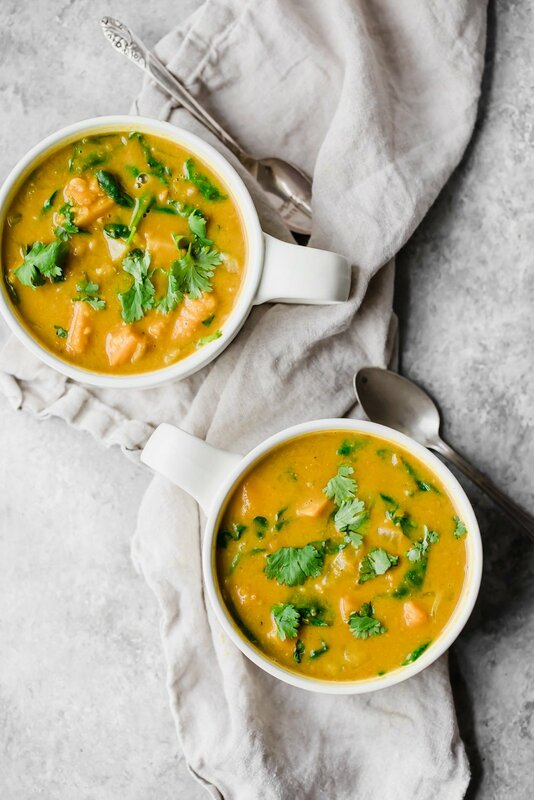 Healing Thai Butternut Squash Lentil Soup that's vegan, protein-packed, and incredibly nourishing. 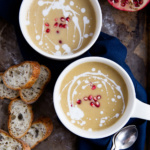 You're going to love this creamy, flavorful soup! Add coconut oil oil to a large pot or dutch oven and place over medium high heat. Next add in garlic, ginger and onion and saute for 3-5 minutes until onion begin to soften. Add in carrot and butternut squash cubes; saute for a few more minutes then add in the yellow curry powder and turmeric. Allow spices to cook together for 30 seconds then immediately stir in coconut milk, vegetarian broth, lentils and peanut butter. Season with salt and pepper. 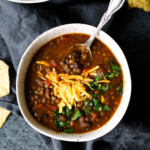 Bring soup to a boil, then cover, reduce heat to low and allow soup to simmer for 20 minutes until lentils soften. After 20 minutes, transfer approximately half of the soup (about 3 cups) to a blender. It’s very important to protect your hands from steam and a potential heat explosion, so please place a clean dish towel over the lid and puree the soup until smooth. I like to start slow, then gradually increase the speed of the blender. Pour the puree back into the pot with the rest of the soup and stir to combine. Finally stir the fresh spinach until just wilted. Taste and adjust the seasoning of the soup as necessary. If you like more of a umami flavor try adding another tablespoon of peanut butter, or even a squeeze of fresh lime juice. This is a soup that can do no wrong! I like to serve mine with cilantro and a handful of peanuts -- it’s also great with a little hot sauce if you prefer a little spice! To make yours in the slow cooker: add all of the ingredients to the bowl of a slow cooker, except I recommend reducing the broth to 2 ½ cups. Cook on high for 3-4 hours or low for 6-8 hours. Continue with blending part of the soup after it is cooked. Flourless Peanut Butter Oatmeal Chocolate Chip Cookies Weekend Favorites: a new playlist for you + sign up for muffin week! 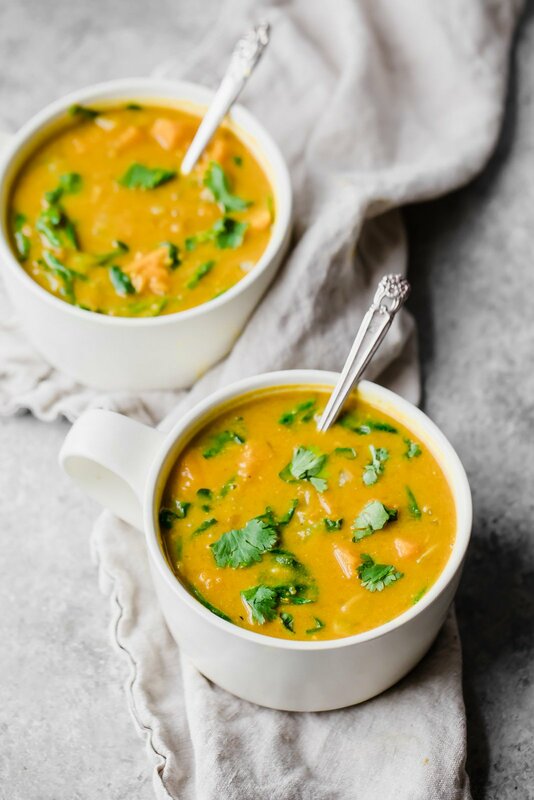 61 Responses to "Healing Thai Butternut Squash Lentil Soup (with a slow cooker option!)" I like to fry the onion and garlic first to release the flavors a bit more, but you can definitely throw it all in if you want! I have red lentils from Trader Joe’s. Can I use those instead? Thank you! 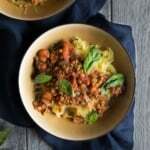 Red lentils tend to break down a bit easier, so I’d recommend sticking with brown or green! Talk about an easy meal!! I like the addition of the lentils! YES so easy and so delicious!! Could you use maybe chickpeas in place of lentils? Looks yummy! The thai flavours are so awesome! Anyways, I absolutely adore Thai food, butternut squash, and lentils. Can’t think of a better recipe that combines the three! You seriously nailed it with this one! Ah it happens! This combo is seriously delish – hope you get a chance to try it! This soup? Or the thai tuna patties from earlier this week? Or both this weekend?! The soup looks amazing! Is it on the sweet side due to the butternut squash? It’s a good mix of sweet and savory with the spices, but definitely has that butternut squash flavor! This was super good! Definitely tasted the peanut butter and the curry and coconut milk go so well together! Another AK winner – thank you! I did cook it a bit longer as I thought the lentils were quite done after 20 min. made this weekend both my husband i loved! So good!! Creamy and slightly sweet with a mild curry spice. I love how nutrient dense this recipe is too! Absolutely! Some of my favorite flavor combos in here. Perfect weekday dinner! I made this tonight, and we loved it! I used sweet potatoes instead of butternut squash since I had them in the house already. The texture with part of the soup pureed is just perfect!! Thanks for another great soup recipe! This looks fantastic! 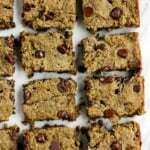 I am a vegan college athlete, so I’m always looking for easy and healthy meals! Quick question, is there anything I can sub the coconut milk with? I’m not a huge fan of it for some reason 🙁 Thank you! I have tons of great vegan options on the blog here! With plenty of protein 🙂 You could try cashew milk in this one! This is so good! I loved it! I can’t say enough about it! I have an immersion blender and went a little crazy (so fun to use), but whatever! I added the lime juice what a yummy addition! Thank you for another great recipe! So happy to hear that Denise! I love using immersion blenders too 🙂 Enjoy! I’m so happy to hear that! Kiddo and husband approved is always a win 🙂 Glad you guys love those muffins, too! Made this yesterday for Dinner with butter rolls n the side. The soup was too good. Kids and Hubby loved it ! Will be a keeper for long time . Hi! Delicious 🙂 So happy to hear that! Yep! If you want a more mild flavor you could use tahini or cashew butter, too. 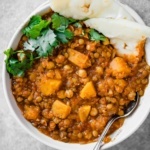 I just got to this recipe via your Butternut Squash, Chickpea and Lentil Moroccan Stew recipe (don’t know how I missed it in the first place! 🙂) and it sounds perfect for a gray, rainy September day. I have one request, if possible? Your nutritional breakdown does not include sodium level. I can still work it out ingredient by ingredient but I’m trying to keep sodium levels low for family health reasons, and often a quick glance at a recipe level will let me know that there are too many omission/substitutions required for easy prep. Would that addition in each recipe’s nutrition list be something doable for you? Love this one! I don’t typically calculate sodium content as the brands + types of ingredients that people use really vary in terms of sodium. Feel free to calculate with the brands that you use in these recipes! Absolutely DELICIOUS! Perfectly balanced ans sooo comforting. Just made this for dinner & it is perfection!! Everything I want a soup to be. Thank you for the delicious recipe! So happy to hear that, Caitlin! So happy to hear that, Ellen! Hi Alex! I typically just use an organic, low sodium chicken broth from Whole Foods (I think the brand is Pacific Foods). This sounds delish!! 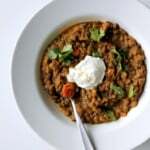 Do you use a cup of dry or canned lentils? Delicious, nutritious & easy!! I used red lentils as that is what I had on-hand, and so it was more like a dal. Also added jasmine rice. I’m trying it tonight as written. Can’t wait to try some of your other recipes. Thank you!! I’ve been living off of your slow cooker recipes and this might be my favorite. Absolutely delicious hearty and so satisfying !!!! I invited my parents for dinner, and we all loved it! Plus plenty of leftovers 🙂 Thanks! I made this and absolutely ADORE this recipe. Super versatile for what’s in your cupboards and super warm, delicious and a good belly feel. I will make this again. It really comes together quickly too which is always nice. Absolutely! So cozy. Glad you love it, Carolyn! This is THE BEST soup!! I started to become skeptical adding in the peanut butter and curry but go for it,you will be amazed! Plus all of the benefits are great. I added in some turkey meatballs for extra protein too. So glad you love it! The peanut butter is next level (and turkey meatballs sound delicious).